Works published between 1770-1785, exact dates not given. Of Sebastian Bach’s four composer sons, J.C.F. lived the least colorful life and achieved the least fame, spending the entirety of his career in one city, seemingly content with a normal domestic existence. While still a teenager, he was frequently occupied in the preparation of the weekly cantata presentations in his father’s Leipzig church, a duty that became more burdensome as the elder Bach’s health began to fail in the 1740s. By 1749 he had been appointed (most likely through the influence of his elder brother Carl Philipp Emanuel) to a court post in the small city of Bückeburg, a position he would retain for the rest of his life. Unlike other members of his illustrious family, J.C.F. was not a revolutionary genius, nor did he ever achieve national or international stardom. His music is elegant and well constructed, and every now and again, as in the Cello Sonata in A, we get clear glimpses of Sebastian Bach’s influence on his son. Although none of the works on this recording are particularly earth shattering, they are pleasant enough. It would seem however that they would be more rewarding to the players than the listeners. The standouts are the two cello sonatas which exhibit a rich harmonic language and a number of elegantly turned musical phrases. For those unaccustomed to listening to the lighter more transparent tone of the fortepiano, the two trios may take some aural adjustment. Yet, one is quickly drawn to the clarity of the instrument’s sound, especially in the nimble hands of Sabine Bauer. CPO have spared us their typically long-winded and obtuse booklet essay in favor of the concise and informative note by Peter Wollny. As always with this label, the presentation is gorgeous and the sound quality is above reproach. 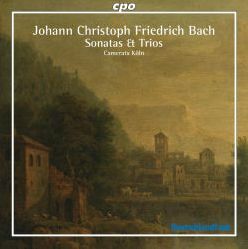 This is most certainly worth a listen and will be particularly appealing to fans of early chamber music. This music is a nice accompaniment for a good book and a glass of wine on a rainy night.